Binge Drinking is defined by the National Institute on Alcohol Abuse and Alcoholism as a pattern of alcohol consumption that brings blood alcohol concentration (BAC) to 0.08% or higher. For the typical adult, this pattern corresponds to consuming 5 or more drinks (for a male), or 4 or more drinks (for a female), in about 2 hours. Binge drinking puts the drinker and others around them at risk of negative consequences such as alcohol overdose, drinking and driving incidents, or alcohol dependence. Colleges and universities across the country are working to reduce the problem of and negative consequences associated with binge drinking. 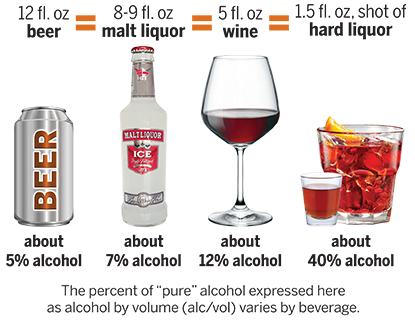 A "standard" drink is any drink that contains about 0.6 fluid ounces or 14 grams of pure alcohol. Below are different drink sizes, each containing approximately the same amount of alcohol and counting as a single standard drink. The examples serve as starting point for comparison. A standard drink refers to one 12-oz. beer, one 5-oz. glass of wine, or one 1.5-oz. shot of distilled spirits. People at risk for developing alcoholism have increased risk with any level of alcohol consumption, even that below a "risky" level. Source: NIAAA Newsletter (NIH Publication No. 04-5346, Number 3, page 3). (Winter 2004). Bethesda, MD: NIAAA Office of Research Translation and Communications, NIAAA, NIH, DHHS.